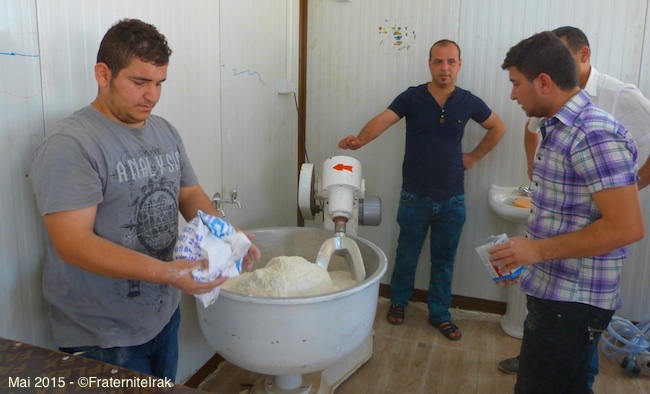 ACTION – Funded and built by the Brotherhood with Iraq, this bakery provides work to bakers of the Nineveh plain who were chased from their homes by ISIS. 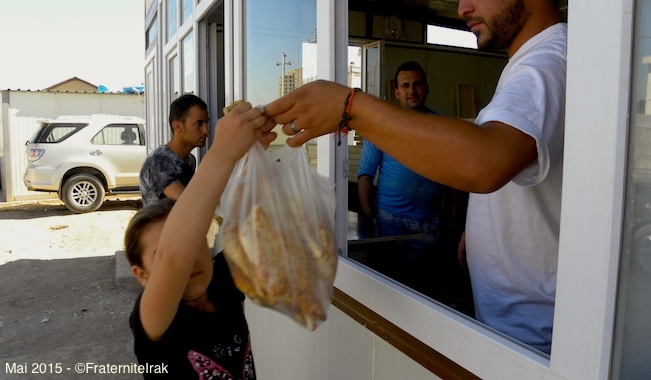 Bread is offered at a discounted price for all displaced people. 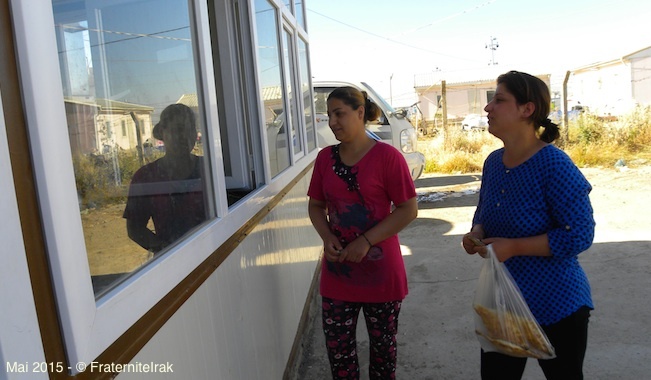 It only took a few weeks to build and open a bakery between Ashti camp and Werenfried camp in Erbil, the capital of Iraqi Kurdistan. 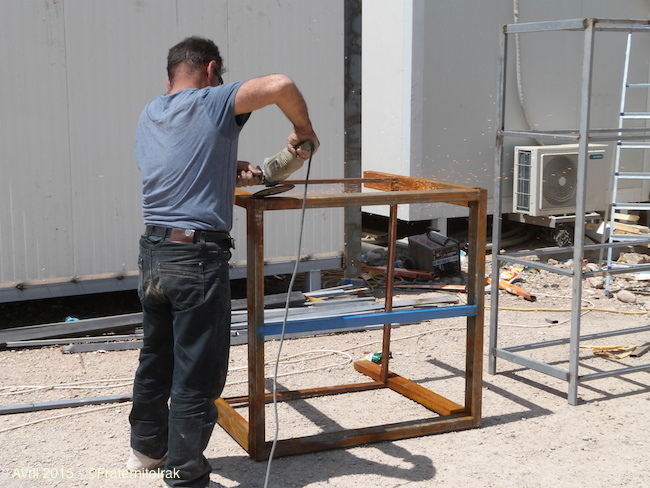 Early April, during the Holy Week, a first team from the Brotherhood with Iraq decided on the location and gathered the technical skills needed to build the structure. 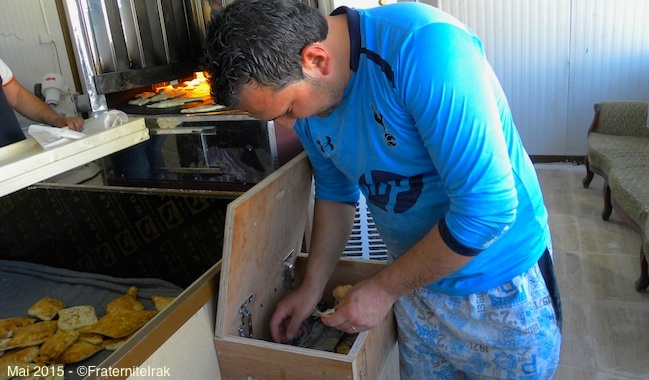 The bread oven was ordered and came from Souleymania, a city located north-east from Erbil. Concrete was poured and consolidated soon after. 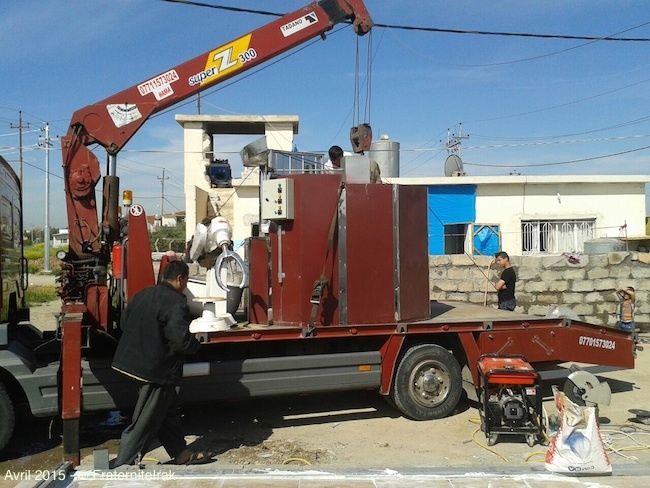 At the end of April, a second team from the Brotherhood with Iraq took over to complete the project. 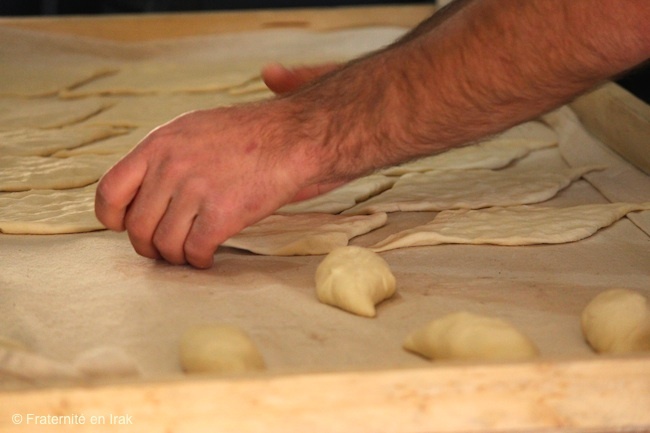 The bakery’s blueprints were designed so that the entire workshop can be disassembled and conveyed. 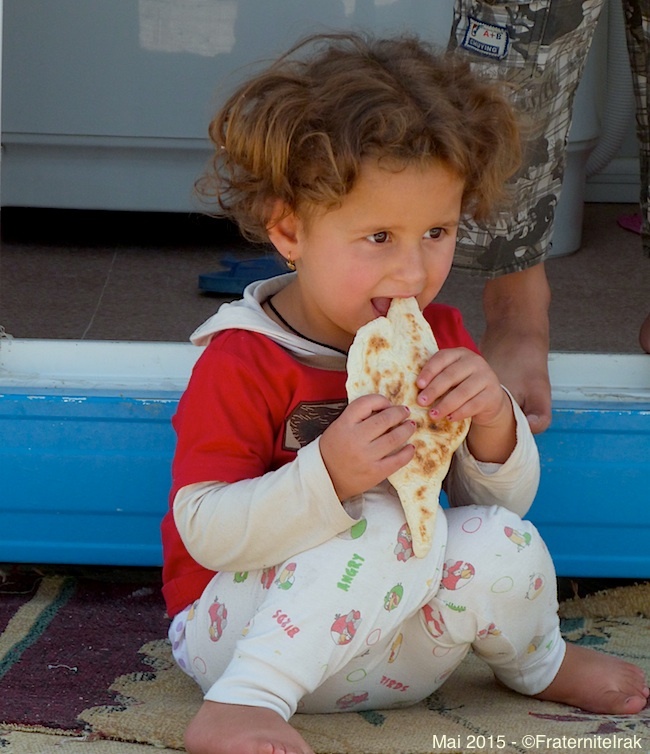 Thus, not only will displaced populations be able to bring the bread oven back home, but also the entire structure of the bakery. Everyone took part in the project. 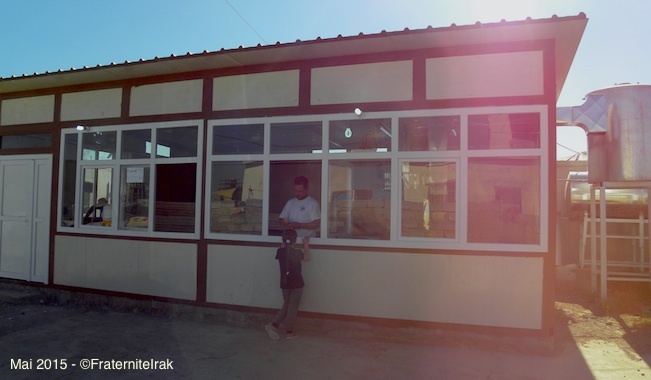 A Kurdish company built the structure together with refugees. To help keep the cost down, some materials were taken from the Ankawa Mall, an abandoned shopping center where hundreds of displaced people lived for several months. 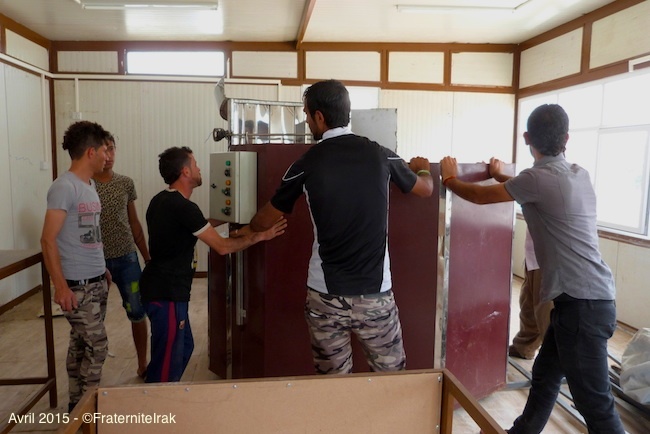 The Brotherhood with Iraq had refurbished two floors of this makeshift camp, including putting up dividing walls to preserve families’ intimacy. 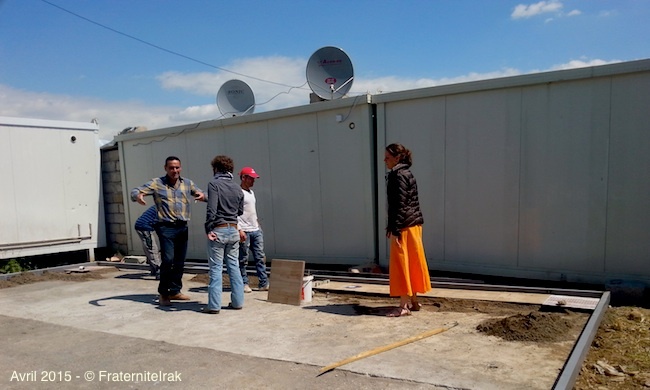 People who lived at Ankawa Mall have now been transferred to Ashti camp, and the dividing walls have been recycled to build the bakery. The association only had to purchase the roof and the windows. 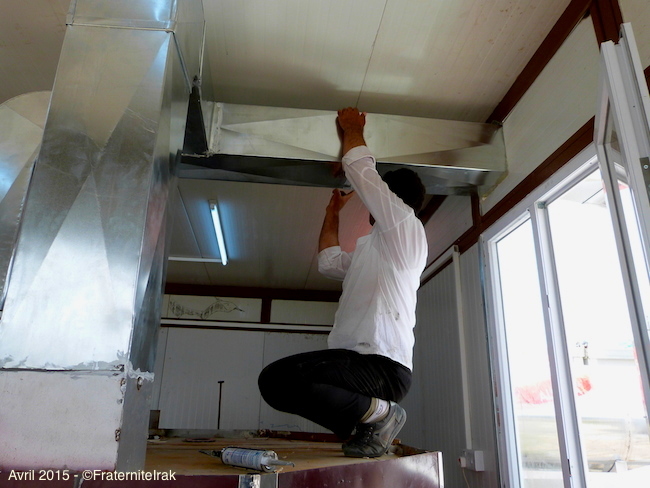 Inside the bakery, all furniture and work surfaces were built by two refugees from Qaraqosh, David and Rassa, who used to work as welders before ISIS chased them from their home. 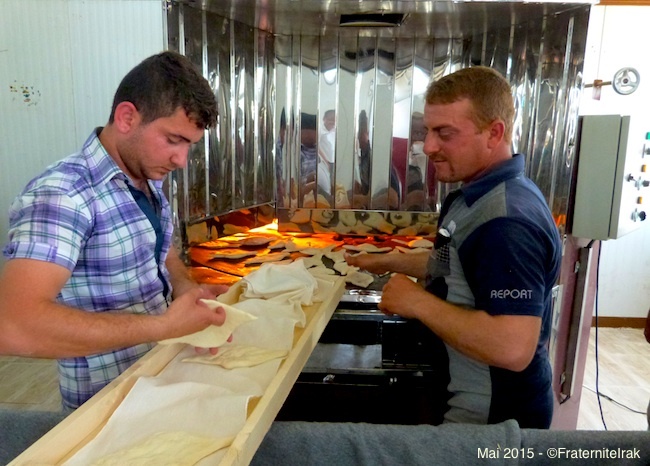 Five bakers have started to work in the bakery, opened since May 4. 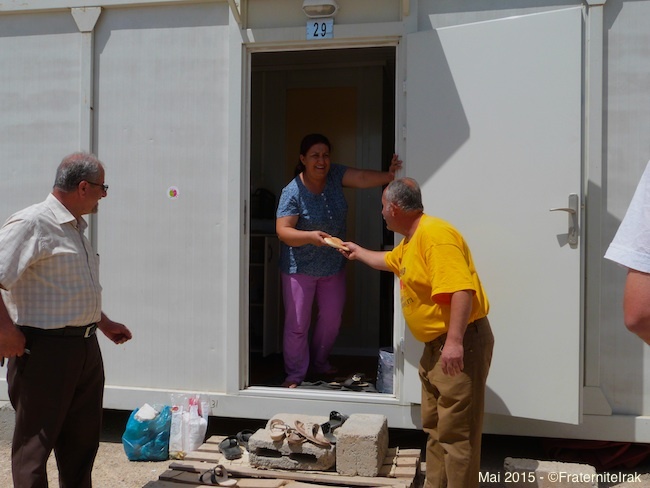 Shand, the team manager, is from Qaraqosh, in the Nineveh plain, and now lives in Kaznazan, a center for displaced people at the Erbil border. 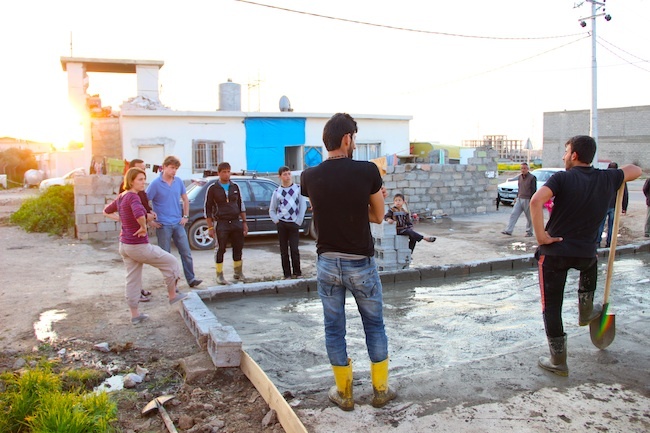 Steven, Behnam and Rassa are also from Qaraqosh and now live at Ashti camp, a few yards away from the bakery. 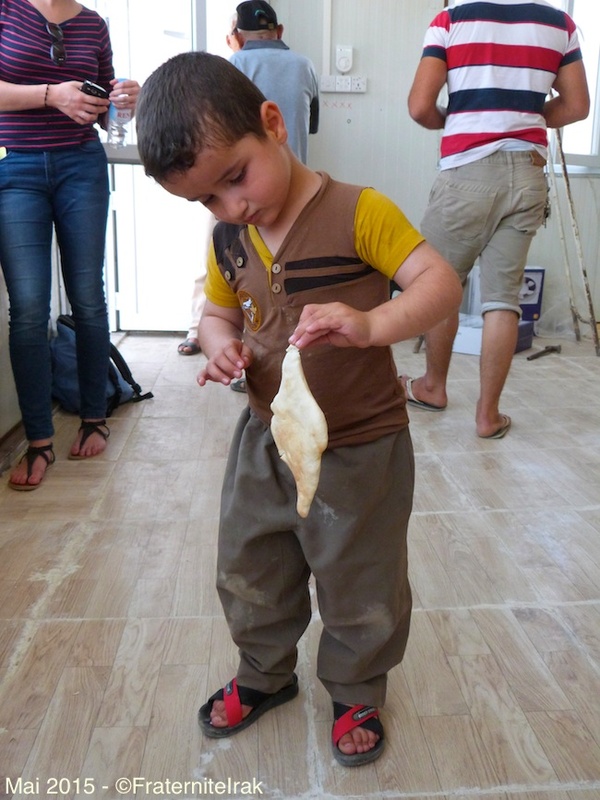 Last, Muchtak comes from Bartalla, another village in the Nineveh plain; he also lives at Ashti camp. Final preparations before the opening. 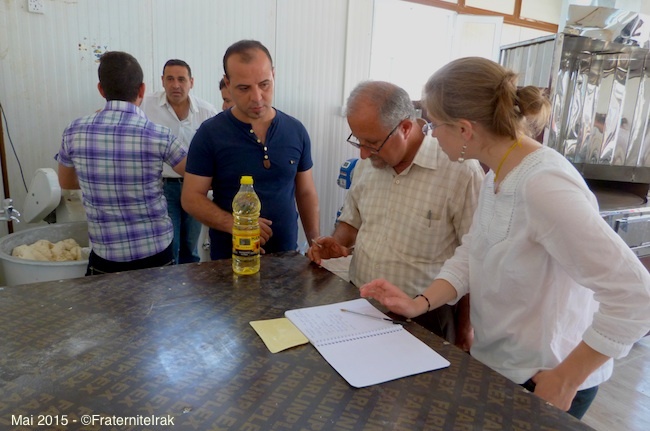 Marie, a member of the Brotherhood with Iraq, reviews the final steps with the bakers. The bakery is also a meeting place! 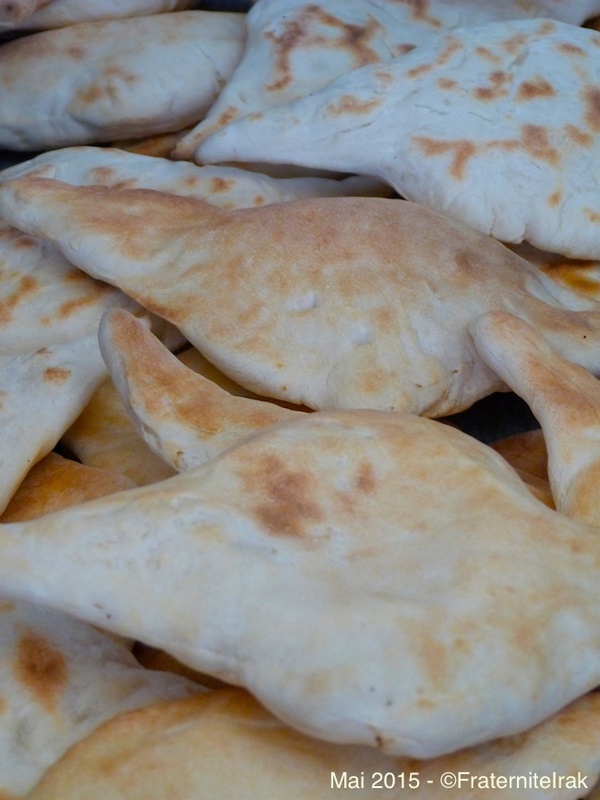 The Brotherhood with Iraq will provide financial support to the bakery during its start-up phase. It will then be entirely managed by displaced people, for displaced populations. We would like to thank the generous donors who provide sustainable support to the Brotherhood with Iraq, and by doing so, who enable the association to complete ambitious projects. We need your help to continue!